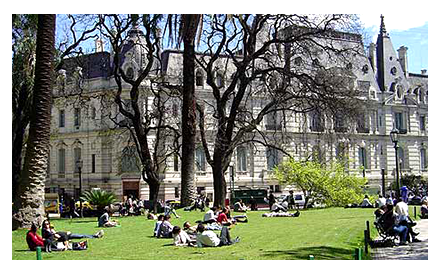 The San Nicolás neighborhood, better known as Centro, Microcentro or Downtown, is the heart of financial and commercial activity in Buenos Aires. Measuring 140 meters across and being one of the world's widest avenues, the 9 de Julio Avenue can also be found in the Centro. In addition to its width, the avenue is also notable for the jacaranda and silk floss trees that line it. The avenue consists of 25 blocks heading north and another 25 blocks that stretch south to the Obelisco, the quintessential symbol of Buenos Aires, in the middle of the downtown area. Other places to visit include the Plaza de Mayo, famous for its political protests and social gatherings from Argentine history; the Casa Rosada (Pink House), the official workplace of the Argentine president; the Catedral Metropolitana; and the Teatro Colón, one of the most important opera houses in the world. The best thing about renting in the Centro is how well-connected it is to bus lines, trains, long-distance buses and subway lines. During working hours from Monday to Friday it is a very busy area, but at night and on the weekends it is more peaceful. A classic and style apartment in the heart of Retiro, ideal for those who need to be near the financial center of Buenos Aires. A spacious room with a comfortable desk to study or work. Single and quiet room to rent in a coloring apartment in Retiro. The room has private bathroom. Classic & comfortable room with private bathroom to rent in a beautiful apartment french style in Downtown/Retiro. Classic & comfortable room to rent in a beautiful apartment french style in Downtown/Retiro. Spacious room (it really is!) with shared bathroom and cable TV. Centric Locaction. Just for women. Ideal for students. Comfortable room to rent located to blocks away from the obelisco and few steps away from the subway station Uruguay. It has cable TV! Ideal for dog lovers. Single room to rent in a very nice apartment in Centro, just a few blocks from Plaza San Martín. A spacious room with a comfortable desk to study or work. A classic and style apartment in the heart of Retiro, ideal for those who need to be near the financial center of Buenos Aires.